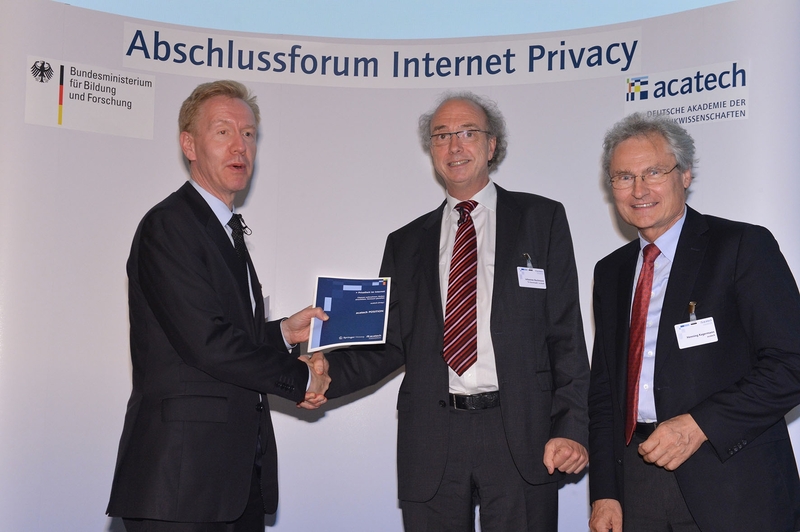 Berlin, 15 May 2013. acatech – National Academy of Science and Engineering supports the development of a culture of Internet privacy. In its new POSITION PAPER “Internet Privacy”, the Academy recommends that the way in which education, regulation, business and technology interact should be shaped in such a way as to allow optimal development of the basic European civic values of free self-determination, political participation and economic wellbeing. To this end, acatech presented an extensive series of recommendations in Berlin on 15 May 2013, together with prototype software for a privacy agent designed to support effective privacy protection for members of the public. There are now more than 1.5 billion Internet users around the world, with at least 50 million in Germany. One particularly important feature of the Internet is that it promotes free self-determination, democratic participation and economic wellbeing. Information and educational content on the Internet can help people to make their own choices about how to live their lives, while people who share the same political beliefs can connect with each other through interest groups. Moreover, in recent years, many new jobs have been created thanks to the Internet. However, virtually every single company that provides free services on the Internet requires users to supply data which they then use to make money, for example by using them for targeted advertising. Personal data are thus a commodity and a currency. This breeds suspicion – many Internet users are sceptical about whether service providers handle their personal data on the Internet with due care and question whether their privacy is always properly protected. Trust between users and service providers, however, is essential in order to maximise the Internet’s potential to benefit social progress and wellbeing. Consequently, acatech set up a project group funded by the Federal Ministry of Education and Research (BMBF) and chaired by Johannes Buchmann (CASED and Technische Universität Darmstadt). Academics from the spheres of law, economics, technology, ethics and sociology worked with representatives of the business community to develop a series of recommendations that will contribute to the establishment of a culture of Internet privacy, thereby relieving the tension between the huge benefits that the Internet offers its users and their concern that it may invade their privacy. Informed use of the Internet requires Internet competence which in turn requires education. Consequently, one of our key goals is the promotion of Internet competence for everyone – in schools, in vocational training and through public information campaigns. There should, for example, be no barriers to users switching between services. The creation of a trustworthy framework will also be supported by harmonisation of privacy law and reliable certification of services. acatech believes that it is important to leave the implementation of any such regulations up to the online service providers. Trustworthiness of online services is one of the keys to their success. acatech believes that their trustworthiness can be enhanced by providing users with options to configure their privacy in a more personalised manner, including, for example, the use of pseudonyms. Furthermore, service providers should support the use of special software known as “privacy agents”, for example through the provision of standard interfaces. Privacy agents help users to protect their privacy. Privacy protection can be made more effective and cheaper if it is taken into account during the design and development of online services. A variety of technical tools are required for this to be possible, from encryption that will continue to be secure in the longer term to methods for allowing anonymous service use and techniques for enabling the right to be forgotten on the Internet. However, these solutions will only be effective if they are designed in a user-friendly fashion right from the outset. A prototype privacy agent was developed as part of the acatech project. This software shows users what information can be extrapolated from their status data on social networks, makes impenetrable general terms and conditions easier to understand, prevents unwanted messages from being posted and identifies services that fail to live up to the user’s expectations regarding privacy. The privacy agent was presented at the project wrap-up forum where participants had the opportunity to try it out. During the 18 months of the project, the interdisciplinary research group, led by Johannes Buchmann of CASED and the Department of Computer Science at the Technische Universität Darmstadt, conducted an in-depth analysis of how to achieve reasonable privacy. The members of the project group were Rafael Capurro, co-founder of the Capurro Fiek Foundation for Information Ethics; Michael Eldred, Cologne; Daniel Nagel, Stuttgart; Martina Löw and Carsten Ochs, Institute of Sociology at the Technische Universität Darmstadt; Günter Müller, Founding Director of the Institute of Computer Science and Social Studies at the University of Freiburg; Christian Flender and Martin Peters, University of Freiburg; Alexander Roßnagel, Project Group on Constitutionally Compatible Technology Design and Head of the Department of Public Law at the University of Kassel; Philipp Richter and Maxi Nebel, University of Kassel; Alexander Pretschner, Head of the Faculty of Software Engineering at the Technische Universität München; Florian Kelbert, Technische Universität München; Michael Waidner, CASED and Chair of Security in Information Technology at the Technische Universität Darmstadt; Hervais Simo and Fatemeh Shirazi, Technische Universität Darmstadt; Wieland Holfelder and Thomas Heimann, Google Germany GmbH; Göttrik Wewer, Deutsche Post DHL; Michael Bültmann, Nokia GmbH and Dirk Wittkopp, IBM Deutschland. During the course of the research project, two acatech STUDIES were published in conjunction with the review of the status quo undertaken at the beginning of the project. Other publications included privacy analyses and options for online social networks and e-commerce (in German and English) and the acatech POSITION PAPER containing the recommendations (also in German and English) which was published at the end of the project. More information on the project and project group is available at www.acatech.de/privacy, where the publications can also be downloaded. acatech represents the German scientific and technological communities both at home and abroad. It is autonomous, independent and a non-profit organisation. As a working academic institution, acatech provides advice to policymakers and the general public on strategic issues relating to the technological sciences and technology policy. Moreover, acatech resolves to facilitate knowledge transfer between science and industry and to encourage the next generation of engineers. The Academy counts a number of eminent scientists from universities, research institutes and industry among its Members. acatech receives institutional funding from the national and state governments along with third-party donations and funding for specific projects. It organises symposiums, forums, panel discussions and workshops to promote acceptance of technological advances in Germany and to demonstrate the potential of new technologies for industry and society. acatech publishes studies, recommendations and statements aimed at the general public. The Academy is composed of three bodies: the Members, who make up the General Assembly, the Executive Board, which is appointed by the Academy’s Members and Senate and which guides the Academy’s work, and the Senate, which comprises well-known figures principally from the worlds of industry, science and politics who advise acatech on strategic issues and facilitate a dialogue with industry and other scientific organisations in Germany. acatech's head office is located in Munich and it has additional offices in the capital, Berlin, and in Brussels. This press release was distributed by ResponseSource Press Release Wire on behalf of Acatech in the following categories: Business & Finance, Public Sector, Third Sector & Legal, Computing & Telecoms, for more information visit https://pressreleasewire.responsesource.com/about.